WordPress 4.7 is now available for download or update from your dashboard. WordPress is a free open source content management system or blogging platform based on PHP and MySQL. This released named “Vaughan” in honor of jazz vocalist Sarah “Sassy” Vaughan. What’s new in this release? 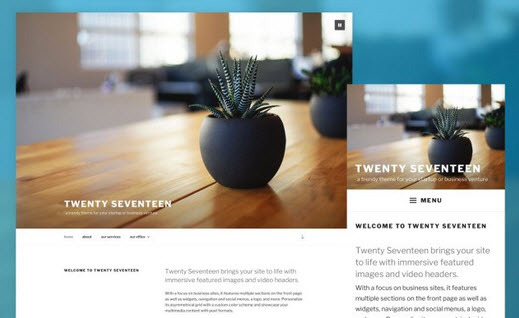 This version of WordPress comes with a brand new theme Twenty Seventeen.Twenty Seventeen is a business theme and features a customizable front page with multiple sections.And added new PDF Thumbnail Previews feature. Now the dashboard user language option will show up in your user’s profilesWordPressss 4.7 comes with REST API endpoints for posts, comments, terms, users, meta, and settings. This version also comes with some developer features like Post Type Templates, Custom Bulk Actions, Settings Registration API and Customize Changesets.Now you can add new pages while building menus. It adds new features to the customizer to help take you through the initial setup of a theme, Visible icons, video headers and allows you to add custom CSS.